Every year, hordes of foodies flock to the latest “superfood:” some ingredient that promises to provide an exponential health boost. Occasionally these foods are just fads, but other times, these ingredients can genuinely make those who eat them more healthy. Holistically, the food we eat plays a huge role in how we feel physically and emotionally. An online study from 2014 found that a diet of sugary and processed food is a risk factor for depression, and other research has shown that the body craves sugar in periods of stress, despite these foods not being the most effective method of releasing pressures. Just as unhealthy foods have a negative effect, eating certain others can boost health levels. We’ve waded through the superfood claims to extract a list of the five foods you should consider adding to your diet. You may be surprised how many of them are already part of your daily meals. How many times have you heard the appetizing term “gut flora?” Gut flora is the community of microorganisms that make their home in your digestive tract, and are the healthy bacteria that help metabolize many of the vitamins and minerals we eat. This bacterial function relies on being fed an army of probiotics. There’s no better place to get these probiotics than through a bowl of yogurt each day. 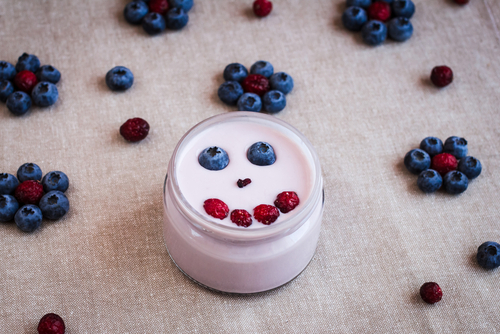 A yogurt that bears the label “live and active cultures” will provide your body with valuable bacterial cultures, in addition to giving a dose of calcium and protein. Choosing a yogurt with natural fruit content will also provide a boost of other valuable nutrients. If you’re looking for a drinkable probiotic alternative, check the dairy section for kefir. Kefir is a fermented beverage packed full of probiotic bacteria, as well as a generous amount of calcium. It’s the perfect drink to take with you on the go, or add into a healthy smoothie. Looking for something to toss into your yogurt? Consider blueberries, the berry with an antioxidant count higher than any other fruit available in North America. In addition to high levels of antioxidants, blueberries also contain fiber and vitamins A and C. This super berry is simple to add into your diet. From yogurt to salads to smoothies, blueberries are incorporated into sweet and savory with great ease. More foods you can add to the probiotic filled yogurt or eat alone as a snack. Nuts such as walnuts, almonds, and hazelnuts are chalked full of Omega-3 fatty acids, vitamin E, and proteins that will help build and restore muscle. Just a handful can provide a valuable health boost each day. A few years ago kale became the food of choice for healthy eating enthusiasts. A bouquet of the leafy green contains an army of healthy vitamins and minerals, giving you more bang for your buck than many other foods. Vitamin A and a generous amount of fiber are just two benefits. Did you know a cup of chopped kale has the same amount of vitamin C as an orange? If you can’t get used to the crunch of kale or if it’s not available in your local grocery store, spinach is a great alternative. Bought fresh or frozen, spinach contains omega 3 fatty acids and other nutrients which can reduce the risk of heart disease and stroke. Both kale and spinach contain lutein and zeaxanthin, two antioxidants that prevent macular degeneration and cataracts, conditions that involve deteriorating eye health as one ages. That’s not the only eye benefit. Leafy greens will also protect the retina from the radiation of blue and UV light, something our eyes are getting a lot of as we stare at computer screens each day. Why make a pot of plain white rice when there are so many healthy substitutes? Quinoa and brown rice are the better choice when searching for a side dish partner in crime. Like kale, quinoa is an oft mentioned superfood. It’s for good reason. The grain is full of fiber and protein, making it a hearty side dish that will have you feeling full longer. Good hot or cold, quinoa’s protein content makes it an especially valuable food for vegetarians and vegans. While brown rice may taste the same as its white grain counterpart, it contains much more nutritional value. Like quinoa, it contains a high amount of fiber, which will help with digestion and moderation of sugar levels. Are you surprised by how many of the foods listed above are quite common or already in your diet? This entry was posted in News, Weight Loss and tagged Healthy Eating. Bookmark the permalink.